Your device can turn songs or music files you have downloaded, such as MP3s, into custom ringtones. You can also set up custom ringtones for your contacts. 4. Touch Ringtones, and then touch Add at the bottom of the screen. 5. Quickly double-touch Sound picker, if necessary, and select the music file you want to use. 6. 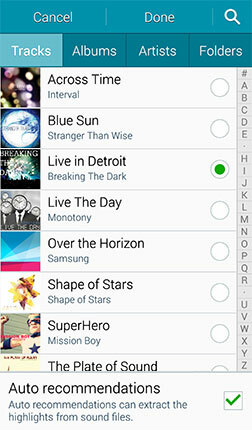 Mark the Auto recommendations checkbox to use highlights from the song for the ringtone, instead of playing the song from the beginning. 7. Touch Done to set the ringtone. 1. From the Home screen, touch Apps > Contacts . 2. Touch the desired contact, and then touch to edit the contact's information. 4. Touch Add to create a custom ringtone from the sounds stored on your device. 5. If necessary, quickly double-touch Sound picker. 6. Select the music file you want to use. You can touch the file name to preview the music file, and touch it again to pause. 7. 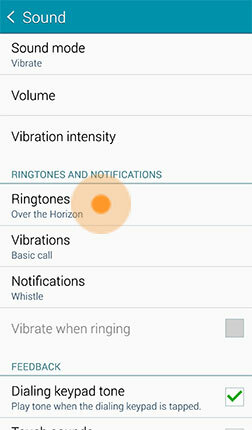 Mark the Auto recommendations checkbox to use highlights from the song for the ringtone, instead of playing the song from the beginning. 8.Touch Done to set the ringtone.